One of the issues with working with Arduinos is the $20-40 cost for a full board when included in your project. Certain levels of code sketches can be run on a single chip replacement, the ATtiny45/85 chips. I bought 10 of the larger memory version ATtiny85 chips for $16.00 from Newark with 50 electrolyte capacitors for another $3.00 or so. This tutorial shows you how to program an ATtiny45 or ATtiny85 microcontroller using the Arduino software and hardware. The ATtiny45 and ATtiny85 are small (8-leg), cheap ($2-3) microcontrollers that are convenient for running simple programs. They are almost identical, except that the ATtiny85 has twice the memory of the ATtiny45 and can therefore hold more complex programs. We like to use both of them with paper circuits and other craft electronics. To program them, we’ll use a port of the Arduino core libraries created by Alessandro Saporetti and slightly modified by HLT. via High-Low Tech – Programming an ATtiny w/ Arduino. More when I get a chance to try this all out! 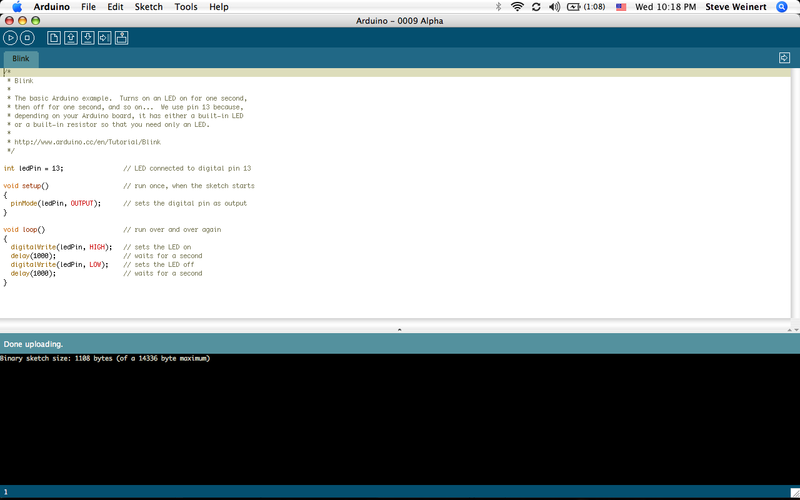 Brian N1BQ’s Arduino Page brings together a mass of Arduino resources as well as a tutorial he is working on. Lessons up to lesson number 7 are already up with 11 more to follow. It is worth bookmarking this one if you are an Arduino experimenter. 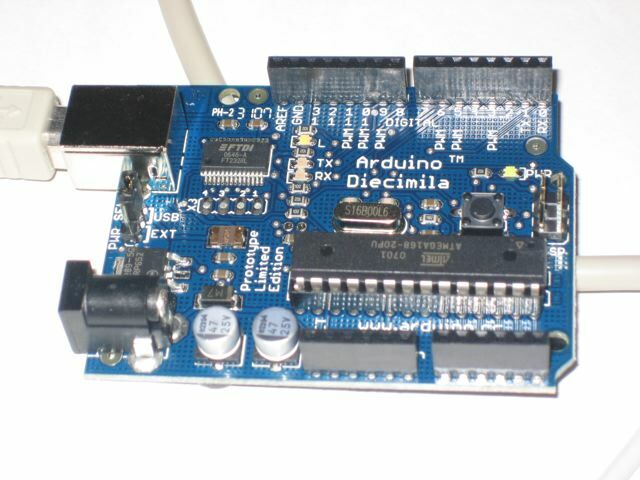 Thanks to Brian N1BQ for the excellent all-in-one Arduino Page! While Winston KC9FVR was building his K-502 Stereo Amp Kit I built up a couple BoArduino “Arduino-less-onboard-USB” kits from Adafruit. The two mounted on top of the breadboard circuit boards are called BoArduinos and the front one is a Arduino with a ProtoShield prototyping daughter board on the top. I had the Arduino & ProtoShield previously built, but whipped up the two BoArduino units. Had myself worried as I had special glasses made for fine detail work and somehow I was mixing them with my regular glasses. Thought my vision was taking a turn for the worse, where I really was just wearing the wrong spectacles! The three boards are being powered by a USB cable for the Arduino with Protoshield, a USB-to-TTL Conversion cable for the USB-less BoArduino on the left and a a nine-volt battery for the USB-less BoArduino on the right. 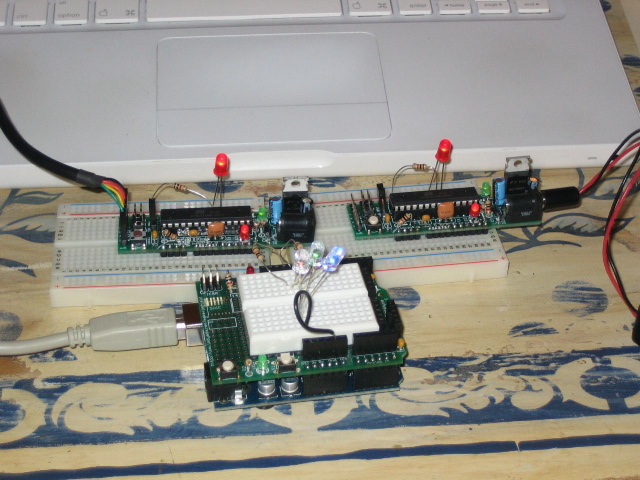 These boards are imbedded microprocessor controller prototyping modules. Once programmed they do not need the computer to run their programs anymore. Check out my previous Arduino related posts (use the search on the right) to find out more on these neat kits! Oh I should admit that unlike Winston KC9FVR I did need to unsolder one resistor… grrrr, I guess I am slipping! Now that we’re getting the Arduino System in hand, we decided we wanted a couple additional units to leave programed and perhaps incorporate into bigger projects.Enter the Arduino’s mini-clone the Boardino. The Boardino is designed to pin-into a breadboard, which is VERY handy, and it reduces its cost and size by off-loading the the USB-to-TTL circuitry to either another board or an intelligent cable. 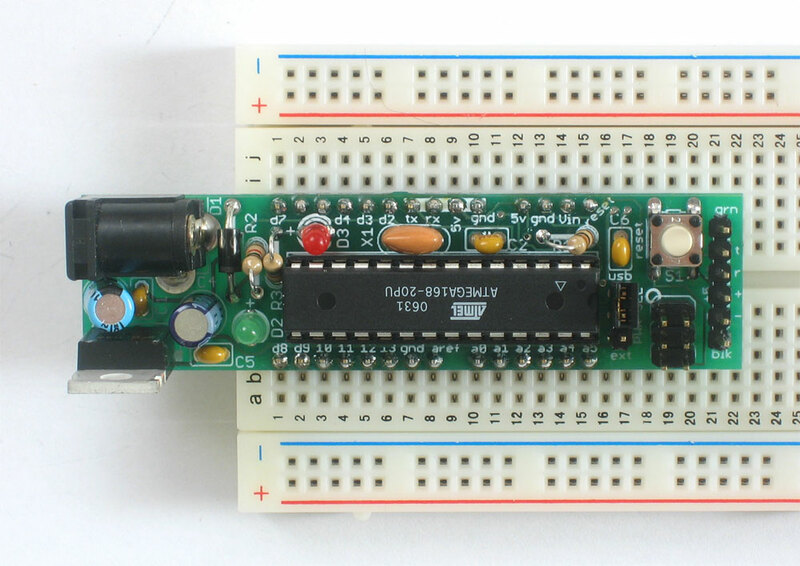 The pin-into the breadboard is a nice and tidy way to make semi-permanent prototypes. Neat! The off-loading greatly reduces costs and as the USB-to-TTL is only occasionally used, is not a hardship. Again I’ve ordered the wanted items from Adafruit. I’ve been working with an Arduino Board from Adafruit. This simple setup breaks out all the input/output (i/o) pins, and every other controllable connection of the Arduino (which is underneath the daughterboard if you look closely at the picture) and with the mini-breadboard makes a nice tidy package. More as I work through the tutorial. My son Tom KC9JGD and I have 30 or 40 potential Arduino projects from our brainstorming while traveling the last few days looking at engineering schools. Now I’ll have to see which can be implemented. As I first mentioned in Flexible Electronic Bits – The Arduino Electronics Prototyping Platform an Arduino Starter Kit from Adafruit was on its way. 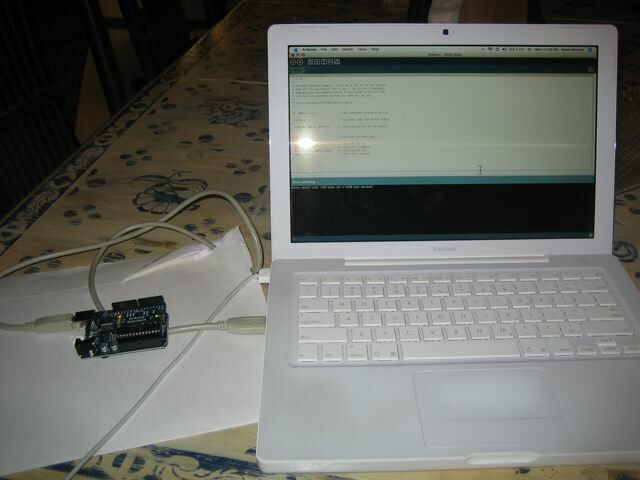 I will be working my way through the Arduino Tutorial – have Lessons 0, 1 & 2 done this evening. I won’t have too much time to play with the device until I get caught up on chores around the house, but first impressions are very positive!